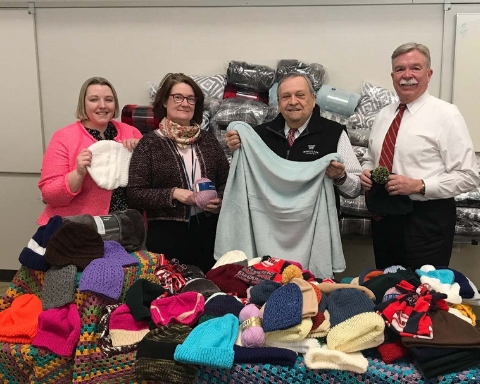 HANSCOM AFB, MA (February 12, 2019) — For the ninth consecutive year, Hanscom Federal Credit Union participated in the Cooperative Credit Union Association’s (CCUA) annual blanket drive to benefit the Massachusetts Coalition for the Homeless. The credit union collected a total of 244 blankets to donate to families experiencing homelessness. Eighty-nine of the blankets were purchased through a grant made by the Enterprise Holdings Foundation to the Hanscom FCU Charitable Foundation, and the remaining 155 blankets were either donated or purchased by Hanscom FCU. In addition, volunteers from the credit union joined together to knit hats for the drive. A total of 86 hand-knit hats were donated, along with an additional 27 purchased hats collected by students in Hanscom Middle School’s Rubber Duckies Advisory Group as admission to a recent holiday concert to benefit the Coalition. Laura Galeski, Social Responsibility Manager, Hanscom FCU; Diana Burrell, Communications Specialist, Hanscom FCU; Paul Marotta, Chairman of the Board, Hanscom FCU; and David Sprague, President and CEO, Hanscom FCU, with donated blankets and knitted hats for the CCUA’s annual blanket drive to support the Massachusetts Coalition for the Homeless.